Measles is on the rise – what should you do? Measles infections continue to spread in Minnesota with cases reported in Hennepin, Ramsey and Crow Wing counties. Unvaccinated children are getting this vaccine-preventable disease, most of whom are under five years of age. HCMC is working closely with the Minnesota Department of Health (MDH) as they monitor and provide guidance for this recent outbreak. 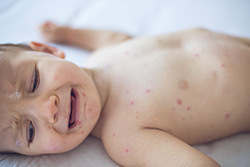 Measles is highly infectious and can cause severe illness leading to hospitalization or even death. Early symptoms of measles include fever, cough, runny nose and watery eyes. A rash then develops which spreads from the head to the rest of the body. Complications from measles include ear infections, pneumonia, and encephalitis (brain infection). Measles spreads quickly among people who have not been vaccinated. The Measles, Mumps and Rubella (MMR) vaccine is highly effective in preventing measles if you are exposed.